Spectre Pearls are made from transparent Mica Particles (like glass) that reflect one color, while letting you see the color underneath. In shade, they have no reflectivity, but in sun, they can have a wide array of different reflective properties. 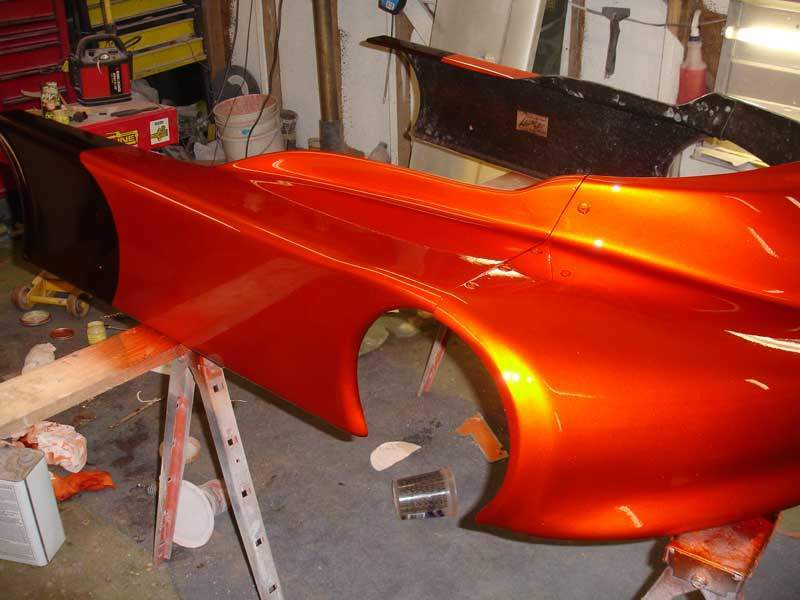 Creating Spectre Pearl paint is as easy as doing any other type of paint, with the exception of adding a few steps to the process. When we describe Spectre Pearls on our site, we are speaking of the type of pearlescent pigments that can be used to create spectre flames, entire iridescent pearl paint jobs, or other spectre effects. Our spectre pearls are what custom painters use to create those beautiful pearlescent effects that people see on many custom paint and even factory paint jobs. 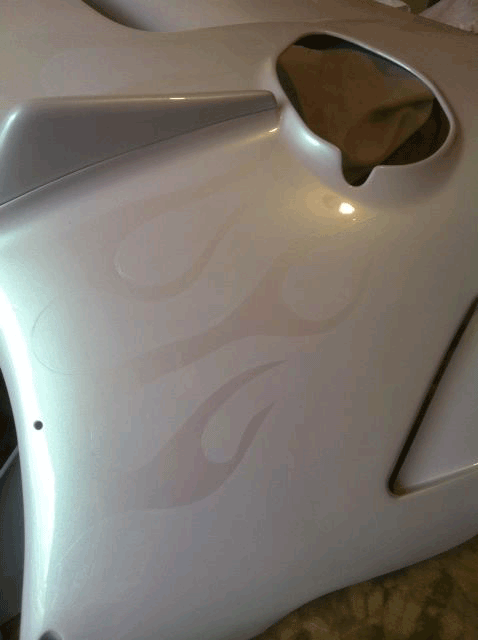 Newer cars and motorcycles can be seen with spectre pearl effects done in the factory, such as the Lamborghini orange paint with the beautiful gold pearl that we see at the auto shows, or simpler pearlescent white paints that we see on new Cadillacs or Infiniti cars, which can be achieved with a simple silver spectre pearl or gold spectre pearl applied over a white base coat. 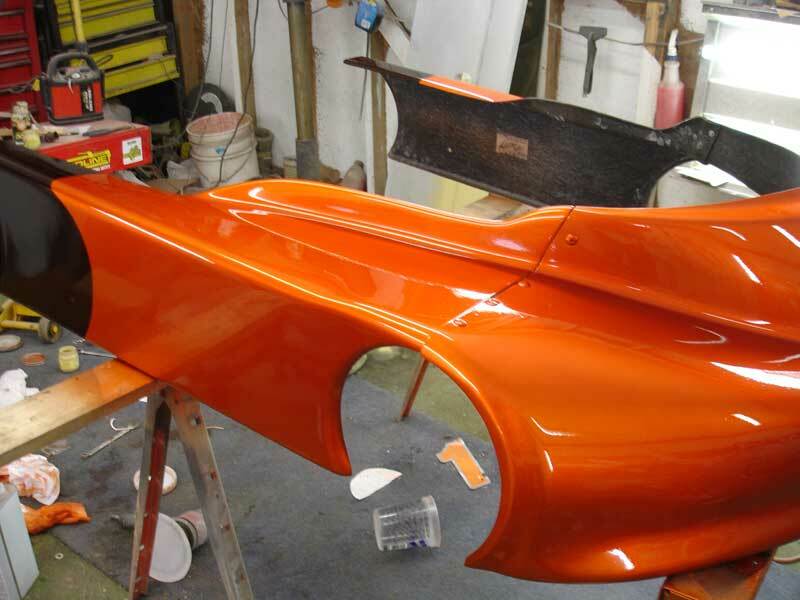 Turning a two-stage paint job into a three-stage paint job is the basic step in creating a quality pearl paint. White base coat: Use any of the spectre pearls, but keep in mind that the red spectre pearl will give you a iridescent pink look in the sun. Blue, violet, orange, gold and silver are the most popular colors for white base coats. Black base coat: You also may use any of the spectre pearls, but keep in mind that using too much will make the project take on the color of the pearl and overwhelm the black. To get a cool midnight color change effect, keep the ratio of pearl down to about a level teaspoon per quart in the clear base or binder. In powder coating, keep the ratio down to a tablespoon per pound and add onto that as needed. Red, Burgundy, or Orange base coat: We highly recommend any of our Gold spectre pearls, including the shimmer gold or the satin gold. Also, Blue pearl red pearl, and violet pearls can make for great effects over the darker shades of red. Blue base coats: For very light blues (like cornflower blue), we have seen excellent results using green spectre pearl, but for a cool color shift on any shades of blue, a violet spectre pearl will give you a cool purple color shift in the sun. Silver spectre pearl paint can also give a nice subtle effect to the darker blues. Green can give an awsome pearl effect over most blue bases as well. Yellow base coat: We highly recommend that you try using green spectre pearl for the lemony yellows, and gold spectre pearl for the darker racing yellows. Green base coat: Gold spectre pearl looks great on green base coats. We have also seen good results with orange and red spectre pearls. Pink base coat: Believe it or not, you will find that silver spectre pearl looks awesome over pink, as does the red spectre pearl. Purple base coat: Try our Red Spectre Pearl, Green Spectre Pearl, or Silver Spectre pearl. If you are still confused over which products would look good over your existing paint, or want to discuss your options, contact us! Or visit our FAQ page for more information.